Dr. (Vaidya) Shweta Rao is a qualified Ayurvedic Practitioner from India, with more than 8 years experience consulting in the field of Ayurveda. She graduated with a Bachelor’s degree in Ayurvedic medicine and surgery from one of the renowned colleges in Mumbai (India). She is also a certified yoga instructor from Yoga Vidya Dhaam Nasik (India). She believes that a proper blend of Ayurvedic lifestyle, diet and yoga is essential for a healthy body, mind and soul and for establishing harmony amongst them. Dr. Shweta, also believes that one cannot control the extrinsic factors which affect our health but one can always make the intrinsic system strong enough with the help of Ayurveda. 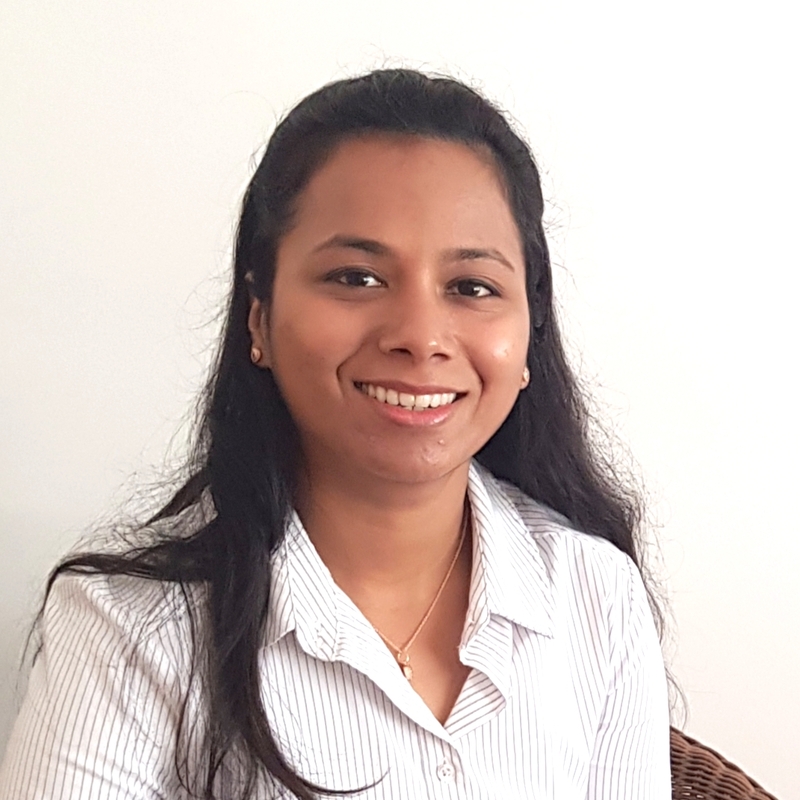 Her interests include management of chronic health ailments, issues related to women’s health, children’s health and lifestyle disorders which can all be managed with Ayurveda and Yoga. Aisha has a back ground as a trained nurse and has worked in this capacity in India and Saudi Arabia. Since coming to Australia Aisha has further extended her studies including her Diploma in Remedial Massage. During her placement at Aspects of Healing she received high acclaim from clients and was offered a position in the clinic being able to offer her treatments. Aisha continued her study in Ayurveda to broaden her skills and has since added Ayurveda treatments to her skill set much to the delight of many recipients. Aisha’s treatments come from within as she has great insight to be able to promote the best outcome for her client’s health. Larisa is Brennan Healing Science Practitioner and Therapist. She offers sessions in Body Psychotherapy, Transformational Energy Healing and Counselling. She has studied Brennan Healing Science pioneered by Dr.Barbara Ann Brennan, a former NASA physicist and best- selling author of ‘Hands of Light’ and ‘Light Emerging’. Larisa received over two thousand hours of training for the last 4 years and able to facilitate physical healing of many dis-ease conditions, quicken recovery from trauma, injuries and surgery, reduce pain and assist with emotional, psychological and spiritual healing. Her extensive knowledge, ability and personal experience are all able to facilitate others on their personal journeys towards self-healing, wellness, health and fulfilment. Through diverse personal and group sessions with Larisa you will develop higher awareness and as a result you will be able to tap into your powerful Divine Essence clearing up all the distorted patterns you have created for yourself out of erroneous believes and fear. From that place of your ‘true self’, you then would be able to create an unlimited reality that is safe, peaceful, joyful and happy! Larisa is a Full Member of National Federation of Healers. Paige Olsen, L.Ac. Dipl. O.M. (US) is a graduate of Emperor’s College of T.O.M. in Los Angeles, CA. In addition to Acupuncture, Bodywork and Chinese Herbs, she has trained extensively in Tai Chi, Qi Gong, Yoga and Taoist Meditation since 1999. For the last eight years she has been in private practice at The Santa Barbara Herb Clinic In California until her recent move to Adelaide. While in Santa Barbara she also started the first Chinese Medical division of Doctor’s Without Walls/Santa Barbara Street Medicine at The Women’s Free Homeless Clinic. Paige’s passion lies in assisting people to find the buried pieces of themselves; those forgotten gems of purity, self love, safety and well being that so easily get pushed aside as we age. Paige applies her intuitive and empirical knowledge of the body, not only to improve her patient’s conditions but to help them regain a true sense of wellbeing. Angela Redman is a certified Aromatherapy and Reiki Therapist with over twenty years experience, a very natural and vivacious person with an extremely positive and optimistic attitude to life. She loves to be happy and encouraging of others with a deep interest in health, fitness and wellbeing. Angela is also an Amazon Best Selling Published Author of “The Energy of Receiving” (Happy Publishing 2015) “Earth Healing” (Happy Publishing 2017). With additional training in Polarity Therapy, Australian Bush Flower Therapy, Transcendental Meditator, Indian Head Massage, Pranic Healing, Polarity Therapy, Life Style Wellness Coaching, Gym Instructor and Holistic Counselling for Body Mind and Spirit. Angela is living a holistic lifestyle and believe this approach is essential and necessary to having a creative and giving existence. Over 20 years ago I purchased a beautiful book on Ayurvedic Health and have continued to refer to it ever since. I’m only just beginning to realise how much this purchase has changed the course of my working career and has inspired my ongoing interest in health and wellness. My love of books has provided me with a wonderful working life, both here and overseas, and has opened my learning to a wide variety of health modalities. I’m a graduate of Griffith University and have a BA in Communications and a great love of music and the creative arts. I love the philosophy of being of service, and the practice of kindness, and am very happy to have the opportunity to be able to provide this here at Aspects of Healing and at Ayurveda Village.